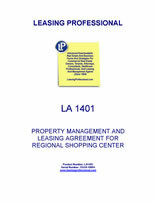 This management agreement is for the management and leasing of a regional shopping center. The manager appointed in the agreement has detailed responsibilities, and will be compensated by receipt of a percentage of the "gross income" of the properties, as well as being reimbursed for its expenses. THIS PROPERTY MANAGEMENT AND LEASING AGREEMENT ("Agreement"), which shall be effective as of the first day of ____________ (hereinafter referred to as the "Effective Date"), is made by and between ____________, a ________ limited partnership (hereinafter referred to as "Owner"), and ____________________, a ________ corporation, (hereinafter referred to as "Manager"). A. Owner is the owner of certain land and improvements thereon consisting of a regional shopping center commonly known as ____________, located in the City of ____________, County of ____________, State of ________, and more particularly described and illustrated in Exhibits A and B attached hereto and made a part hereof, hereinafter called the "Project." B. The Project, together with the parcels of land and improvements thereon owned by or leased to certain major departments stores, is subject to a Construction, Operation and Reciprocal Easement Agreement, dated ______________, recorded in Book __, at Page _______, in the officials records of ____________ County (hereinafter referred to as the "REA"), by and among Owner, and _____________, _____________, and _________________ (the "Majors"). The Majors and any other major department stores which lease buildings or parts thereof from Owner, are hereinafter referred to as "Major Department Stores." The Major Department Store parcels subject to the REA shall hereinafter be considered a part of the above-referenced Project. Capitalized terms used in this Agreement which are not defined herein, shall have the same meaning in this Agreement as the same are defined in the REA. C. Owner desires that Manager manage the Project as Owner's sole and exclusive managing agent, with the responsibility for marketing, management, operations, maintenance, leasing and servicing the Project and for the performance on behalf of Owner of certain obligations of Owner as lessor under all leases of space in the Project and under the REA. Manager desires to accept such employment, subject to the terms and conditions hereinafter set forth. 1.1 APPOINTMENT. As specified more particularly below, Owner hereby hires and designates Manager as its sole authorized manager and exclusive leasing agent for the Project. Manager, by its execution hereof, does hereby accept such appointment upon and in accordance with the terms hereof. 1.2 GENERAL DUTIES. Manager shall establish an on-site property management team and shall perform its duties hereunder in a diligent, careful and vigilant manner so as to manage, operate, lease, maintain and service the Project as a shopping center in the State in which the Project is located. The services of Manager hereunder shall be of scope and quality not less than those generally performed by professional property managers of other shopping centers in the area in which the Project is located. Manager shall provide to Owner the full benefit of the judgment, experience and advice of the members of Manager's organization and staff and will perform services as may be reasonably requested by Owner in marketing, operating, maintaining, servicing and leasing the Project. Manager shall use due care in the selection and supervision of all employees and independent contractors who shall operate and maintain the Project. Manager shall oversee the activities and performance of all of its employees and independent contractors retained to carry out this Agreement. 1.3 STATUS OF THE PARTIES. In the performance of its services under this Agreement, Manager shall act as an independent contractor. However, where Manager contracts on behalf of Owner with third-party vendors, contractors or service agents, Manager shall do so as an agent of Owner and shall represent the same to any such third-party vendor, contractor or service agent. Nothing in this Agreement, or in the relationship between Owner and Manager, shall be deemed to constitute a partnership or joint venture. 1.4 CONTINUING STANDARDS. Manager agrees, notwithstanding the authority granted herein, to confer fully and freely with Owner in the performance of its duties, and to continue to remain informed regarding the Project. Notwithstanding the authority granted herein, Manager further agrees to abide by those standards and instructions which Owner may issue from time to time regarding the operating of the Project. Without limiting the general duties and standards described in ARTICLE 1, above, or arising under any other provisions of this Agreement, Manager shall perform the following services. 2.1 ACTION AUTHORIZED WITH RESPECT TO LEASES. (a) Commencing on the Effective Date, as that term is defined in ARTICLE IX, Manager shall perform all duties of Owner as lessor under the leases with Project tenants and Major Department Stores leasing space in the Project (collectively referred to as "Tenants") so that said leases shall remain in full force and effect. (b) Commencing on the Effective Date, Manager shall collect all rent and other monies due from Tenants and any sums otherwise due Owner with respect to the Project in the ordinary course of business (hereinafter referred to as "Rent"). Owner authorizes Manager, as appropriate, to request or demand (either orally or in writing) that Tenants pay Rent and to receive and collect all Rent on behalf of Owner. Subsequent to the specific authorization of Owner, Manager shall institute legal proceedings in the name of Owner or Manager for the collection of delinquent Rents and other charges and for the dispossession of Tenants and other persons from the Project as an extraordinary legal service pursuant to SECTION 2.3, below. Manager shall deposit promptly all monies so collected on behalf of Owner in a separate bank account or accounts of Owner established pursuant to ARTICLE IV, below. Except as specifically provided for in SECTION 4.1, Manager shall not commingle funds in such account or accounts with any funds of Manager. (c) Commencing on the date Manager's right to lease becomes effective as described in SECTION 2.2, Manager is authorized to negotiate all new leases, lease renewals and any assignments, amendments or terminations thereof. However, Manager shall not hold itself out as having the authority to execute or approve any leases, assignments, amendments or terminations thereof without the prior written approval of Owner. (d) Should Manager, during the term of this Agreement, provide to a Tenant any services in addition to the above, which are not provided for under the leases and for which a separate charge is made (hereinafter called "Additional Services"), then the charge made to the Tenant for Additional Services shall be paid to and retained by Manager for its own account. Manager shall notify Owner of its intention to provide Additional Services to a Tenant or Tenants where such services will be substantial in nature and will directly affect the operation of the Project. Owner shall have the right to prohibit Manager from undertaking such services if, in its reasonable business judgment, the performance by Manager of the Additional Services would adversely affect the professional relationship and corresponding rights and duties created by this Agreement. Manager shall pay all costs and expenses associated with the Additional Services. 2.2 LEASING SERVICES. Commencing on the Effective Date, Manager shall have the exclusive right to lease space in the Project. Manager shall use its best efforts to negotiate and procure new leases and lease renewals for Owner on terms and conditions most favorable to Owner. All leases shall be negotiated on terms and conditions and in a form acceptable to Owner. Upon execution of this Agreement, Owner shall provide Manager with a copy of the standard lease which Owner requires to be used, subject to negotiated modifications, for any vacant space in the Project. Manager shall prepare all documentation for any lease transaction, including without limitation, new leases, lease renewals, assignments and terminations. Manager reserves the right to delegate the leasing of space in the Project, or a portion thereof, to third-party leasing agents or brokers, who are not parties to this Agreement, if, in Manager's professional opinion, such delegation is in the best interests of Owner. However, prior to such delegation by Manager, Manager will procure the approval of Owner to that delegation. In the event a delegation is made to a third-party agent or broker, or if a third-party agent or broker secures a Tenant for the Project, Manager shall be entitled to receive its commission in accordance with ARTICLE 7, SECTION 7.2(v). Manager shall, at all times, exercise good faith and act with the best interests of the Owner in mind when dealing with third-party agents and brokers. Leasing commissions will be paid from the Account as defined in ARTICLE 4, SECTION 4.1 hereof. If within one hundred and eighty (180) days after the expiration or termination of this Agreement, or any extension thereof, any lease is entered into by Owner in the Project with a person or entity (i) with whom Manager had been negotiating, actively within one hundred and eighty (180) days prior to said expiration or termination and whose name Manager had provided to Owner upon said expiration or termination with a list of all other persons or entities with whom Manager had been negotiating, or (ii) whose proposed lease had been submitted to Owner within one hundred and eighty (180) days prior to said expiration or termination, then the leasing commission for such Lease(s) shall be due and payable to Manager by Owner. 2.3 LEGAL SERVICES. Manager shall retain attorneys to provide legal counseling to the extent Manager, in its reasonable business judgment, deems such to be necessary or advisable to the efficient and prudent operation and management of the Project. Said counseling shall include advice on the interpretation of legal rights and duties, the proper procedure for the enforcement of lease terms and the preliminary protection of Owner's rights. Manager shall be entitled to bill Owner, independently of this Agreement, for any legal services provided by Manager's in-house attorneys on behalf of Owner and said services shall be considered extraordinary legal services outside the scope of normal management services. Before any lawsuit, in excess of _______________ Dollars, is commenced in Owner's name, Manager shall notify Owner of the need for such action, and Owner shall promptly direct Manager as to the course of action Owner desires Manager to take. Manager may recommend, but Owner shall select, those attorneys who are to carry out and supervise the legal action. Manager shall advise Owner promptly, with confirmation in writing, of the service on Manager or Owner of any summons, notice to appear, subpoena or other legal process, including any notices, letters, or other communication asserting an actual or alleged liability of the Owner of the Project. 2.4 MARKETING SERVICES. In the event Owner requires the Tenants to establish a Merchants' Association or, in the alternative, to contribute to a Marketing or Advertising Fund, Manager shall perform Owner's administrative duties in connection therewith. In this regard, Manager shall retain the services of a Marketing Director, who together with Manager's entire organization, shall provide specialized marketing services to the Project through the use of multimedia advertising campaigns, general programs and special events designed to create an identifiable image for the Project within its trade area. The compensation (gross salary and wages, payroll taxes, workers' compensation and other salary and wage benefits) of the Marketing Director and all other personnel hired to perform secretarial and clerical functions is an expense of Manager and shall be paid as an expense of the Merchants' Association, or in the alternative, an expense of the Marketing or Advertising Fund if said fund is established. The amount of compensation as well as any other expenses of the Marking Director and all other personnel hired to perform secretarial and clerical functions is as set forth in the approved marketing plan as defined in the governing documents of the Merchants' Association and the budget for the Marketing or Advertising Fund as approved by Owner. 2.5 SPECIAL SERVICES WITH RESPECT TO MAJOR DEPARTMENT STORES. Owner shall provide Manager with copies of the REA and other agreements existing between Owner and the Major Department Stores if Owner intends that Manager perform Owner's obligations set forth in said agreements. Manager shall review and familiarize itself with Owner's obligations under said agreements and consult with Owner to determine those obligations which Manager shall perform on behalf of Owner. In addition, Manager shall enforce Owner's rights under said agreements which shall include, if requested by Owner, billing each Major Department Store for its share of the costs incurred in the operation and maintenance of the common areas and enclosed mall. In the event any Major Department Store shall fail to perform any of its obligations as set forth in said agreements, Manager shall promptly notify Owner of such event and consult with Owner as to the appropriate course of action to be taken by Manager. 2.6 SPECIAL SERVICES WITH RESPECT TO CONDEMNATION. Upon request by Owner, Manager shall act on behalf of Owner in eminent domain proceedings for the condemnation of the Project or any portion thereof, and in consultation with Owner, employ independent real estate experts for appraisal and testimony in connection with such proceedings. Manager shall make recommendations as to the advisability of compromise or settlement of any such proceedings. 2.7 CONFLICT WITH PARTNERSHIP AGREEMENT. In the event any term, covenant or condition contained in this Agreement conflicts with any term, covenant or condition contained in the ____________ Articles of Limited Partnership (dated ___________), as amended, hereinafter referred to as "Partnership Agreement," by and between ____________, and ___________ , the Partnership Agreement shall prevail. 2.8 APPROVAL OF LIMITED PARTNER. Notwithstanding anything to the contrary in this Agreement, Manager shall take no action which, pursuant to the Partnership Agreement, requires approval of Owner's limited partner, ______________, hereinafter referred to as "Company," without first obtaining said approval. Actions requiring approval of the Company are described in "EXHIBIT C," which is incorporated by reference herein. (e) The annual operating budget described in SECTION 5.3 hereof. Manager shall not take any action which materially deviates from the terms of the Annual Plan without obtaining the prior written consent of Company and Owner. Manager shall secure Owner's and Company's approval of all Project Tenants and of the terms of any new or renegotiated leases with new or current Project Tenants. 2.10 REA OBLIGATIONS. Manager shall perform all duties of Owner as Developer and Operator under the REA for operation, maintenance and day-to-day management of the Project, so that no default or event of default on the part of the Developer or Operator shall occur thereunder and the REA shall remain in full force and effect. Without limiting the generality of the foregoing, Manager shall arrange for and supervise the performance of all duties of Operator as set forth in the REA for operation, maintenance, servicing, repair and replacement of the Project including, but not limited to, the Common Areas and Enclosed Mall.